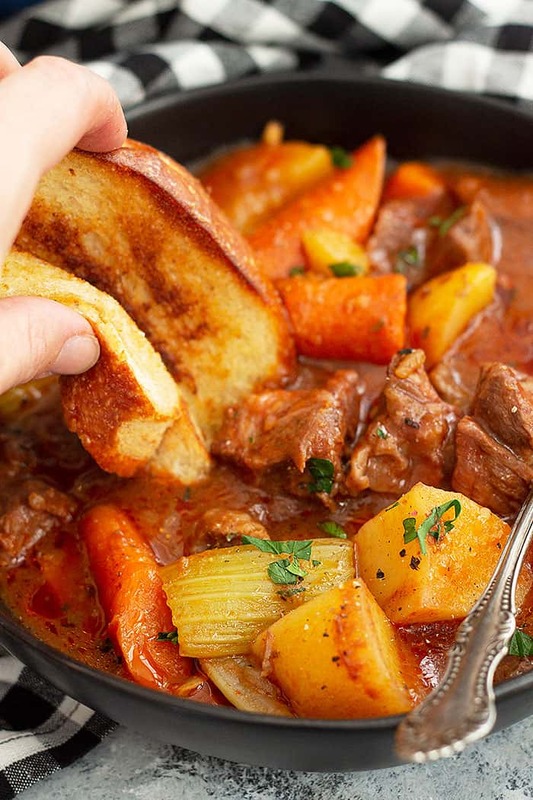 This Hearty Beef Stew is a classic beef stew recipe. It’s full of fall apart tender beef in a hearty gravy. Oven and slow cooker instructions included. I am digging this wonderful recipe up from deep within the archives. It needed a total make over!! I remember eating this frequently growing up. Both my Mom and Grandma would make this comforting dish on cold days and it’s the perfect stick to your ribs kind of meal to warm up with. 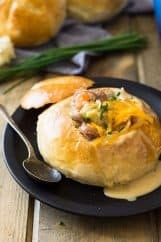 A few other hearty dishes you should try are: Upside Down Pizza Casserole, Skillet Beef Pot Pie, and Slow Cooker Pot Roast. This beef stew couldn’t be an easier recipe. Just place everything in the pot and cook away. You can sear the meat to add more flavor and be sure to deglaze the pan with a little beef broth or red wine even to get all those flavorful bits up. Browning the meat will also make the sauce a deeper and slightly browner color. Not a bad thing, just more flavor is all it means. I am putting the recipe I grew up eating in the recipe card. But I will also put in the instructions for making it in the slow cooker and in the notes, I will add the extras I put in the stew. And if you want really tender chunks of meat, choose a nice chuck roast. It’s marbled and when cooked slowly the marbling will melt into the meat making it oh so tender. Also, cooking it low and slow is the way to go for tender meat. Some nice cuts would be Chuck, Chuck Shoulder, Chuck Eye Roast. 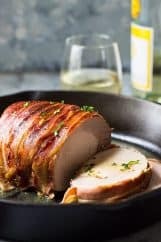 You can also use round roast in a pinch. It’s not as marbled but it will still be tender. Also if you find stew meat which is either chuck or round. It is a great replacement and the work of cutting up the meat is already done for you! Bread. I love toasting up thick slices of bread with a little butter and garlic. 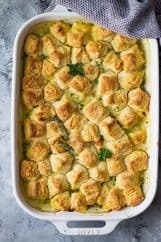 Or make some fresh bread crumbs in your food processor and add them to a skillet with melted butter and some chopped garlic. Cook until lightly browned and fragrant. Sprinkle over your beef stew, YUM!!! 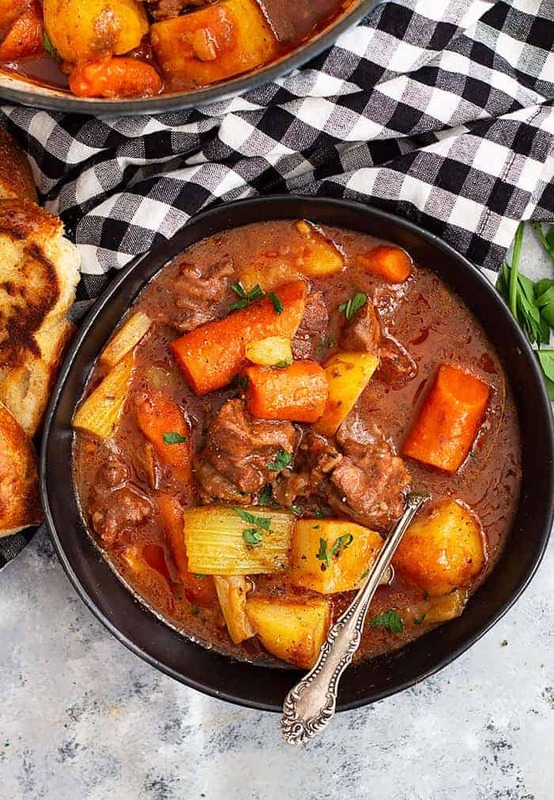 This Hearty Beef Stew is a classic beef stew recipe. It's full of fall apart tender beef in a hearty gravy. Oven and slow cooker instructions included. Preheat oven to 250 degrees F (121 degrees C). Place meat in bottom of a large pot that has a tight fitting lid. Layer vegetables over meat. In a medium bowl combine remaining ingredients and pour over meat and vegetables. Cover with lid. Bake for 5 hours and most importantly DO NOT PEEK!! Not even once!! Place meat and vegetables in a 6 quart slow cooker. In a medium bowl combine the remaining ingredients and pour over meat and vegetables. Cover and cook on LOW for 8-10 hours. This recipe will freeze well for up to 3 months. Thaw and reheat as needed. Quick cooking or Minute tapioca can be found in the baking aisle next to the pudding. Brown the meat and deglaze the pan with a little red wine. This will really add a lot of beef flavor to the sauce. It will also make the sauce a richer color. If you don't have tomato juice a great substitution is 1 (15oz) can tomato sauce and 2 cups beef broth. I do this almost everytime because I don't have tomato juice on hand. Can also substitute potatoes with sweet potatoes. 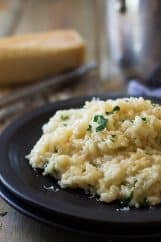 This recipe was originally published October 2015. Mmmm there is nothing better than a big bowl of hearty stew on a chilly fall day! Why thank you so much, Julie!! In the beef Stew recipe, WHY add a Bay Leaf ? It adds flavor to the stew, but feel free to leave it out. Tapioca Is not sweet. It is an ingredient used for thickening. It can be used to make Tapioca pudding which is so good, but really is vanilla pudding thickened with tapioca. A real treat. It is used as the thickening in fruit pies. When I was a child, we often had thickened canned fruit or fruit juice thickened with tapioca as our dessert. You always had dessert at the end of your meal. 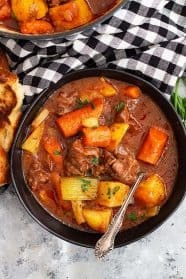 I think the reason you are not to peek while your stew is cooking is to shorten the longer slow cooking time, which makes for a more tender and blended flavor of your stew. peeking lets out the steam and heat and therefore lengthens the cooking time. That makes sense now not to peek! Thanks Grandma!! This is beautiful! I need to make it for my husband. He’d love it! Thanks for the recipe! Thank you so much!! Let me know how you like it!! Love all the recipe tips and knowing I can freeze a batch! This looks amazing! Nothing warms me up like Beef Stew on a cold day! Can’t wait to try this version! Thank you, let me know how you like it!! 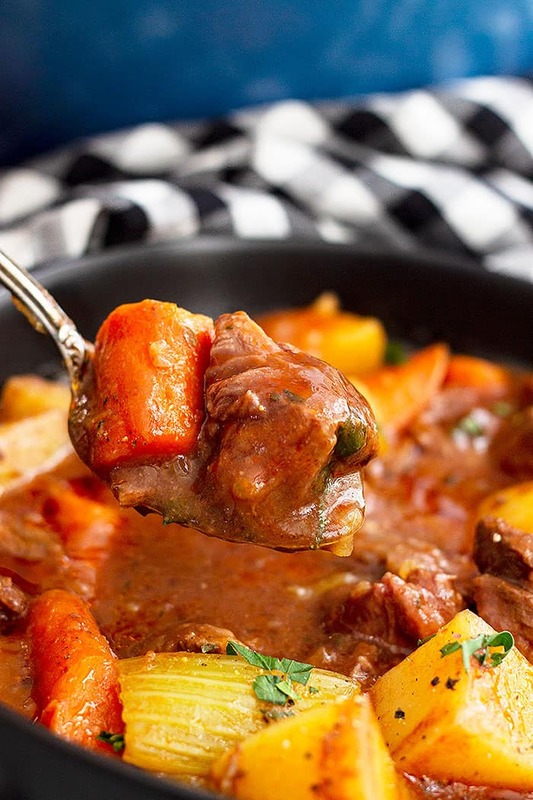 There’s nothing like a hearty beef stew to enjoy at the end of the day! My daughter (who previously ate nothing due to allergies and texture issues) LOVES beef stew and thinks it’s the best thing ever! I’ll definitely have to give your version a try! That’s great!! Let me know how you like it!! This is SO GOOD! Love how rich and hearty this soup is! It froze really nice too, leftovers where great. Thank you so much, and so glad you liked it!! Why in the world do you use Tapioca????? It is used to thicken the stew and not to be confused with the box of tapioca pudding. They dissolve while cooking and you don’t even notice them.